Orthopedics of Illinois™ also known as Orthoillinois™ provides leading medical care for the musculoskeletal system through orthopedic and sports medicine, utilizing transcendent clinical and surgical technology in addition to unending research and education. Orthopedics of Illinois™ serves the greater McLean, Livingston and Champaign counties with two outpatient facilities located in Normal and Champaign Illinois. 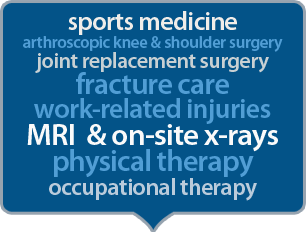 Orthopedics of Illinois™ is comprised of several divisions and affiliations including a diagnostic imaging center, outpatient rehabilitation, providing both physical and occupational therapy, and also multiple outpatient surgery centers conveniently located throughout the communities served. Orthopedics of Illinois™ is committed to providing superior orthopedic care as well as building enduring community relationships through the highest standards of integrity, honesty, leadership, and team work.